FROM LEFT: Robert Larson, Paul Statler and Tyler Gassman are fighting for damages under Washington's Wrongful Conviction Compensation Act. Paul Statler wants his four years, seven months and 10 days back. That's how long he spent behind bars, in a cramped, concrete cell, for a crime he says he didn't commit. When a Spokane judge tossed out his sentence three years ago, Statler emerged from prison a different person, reeling with anxiety, fearful of crowds and unable to get a job. "Sad to say, I have a hard time trusting authority figures now. Everytime I go out, I wonder if I'm going to end up in a situation where I'm arrested or attacked by a cop or a crooked detective," he says now. "I'm still trying to recover from that." 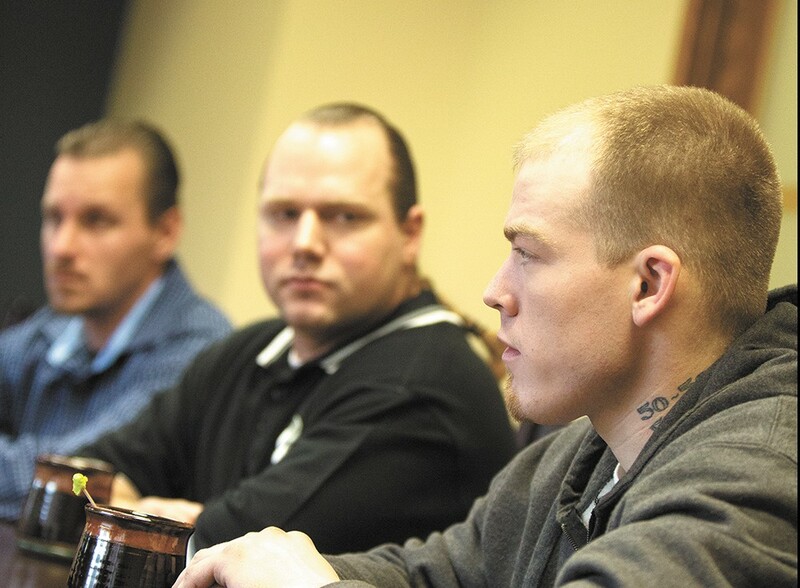 Six years ago, a jury found Statler, his cousin Robert Larson and an old high school friend, Tyler Gassman, guilty of robbing a couple of drug dealers in April 2008, despite their pleas of innocence. The case against them was built on the state's only witness, a 17-year-old jailhouse informant named Matthew Dunham, who after having been arrested for armed robbery, testified that the three men helped him commit a string of drug-related robberies in Spokane Valley. In exchange for his testimony, Dunham received an exceptionally lenient sentence of 19 months in juvenile detention. Meanwhile, Statler, Larson and Gassman were sentenced to decades in prison. Statler received the longest sentence: 41 years. In December 2012, a judge, considering new evidence and criticizing the men's defense, tossed out their convictions, ordered a new trial and released them back to their tearful families. The following July, the state dropped all charges. Last week, the three men were back inside Spokane County Superior Court, in the same room in which they were convicted six years ago. This time, they were sitting behind the plaintiffs' counsel table. The three men are suing the state for damages, together totaling more than half a million dollars, under Washington's Wrongful Conviction Compensation Act. This is the first time since the law was passed in 2013 that a case like this has proceeded to trial. Judge John Cooney is expected to issue a ruling in a month. To win, they needed to show Judge Cooney, with clear and convincing evidence, they are "actually innocent," as the statute states, of the crimes they were originally charged with — a higher standard than in traditional civil cases. "It's challenging from the get-go because you're representing innocent parties that have been unfairly and wrongfully convicted for something they didn't do," says their attorney Mack Mayo. "And on top of that you have a higher burden of proof and you have to prove a negative." 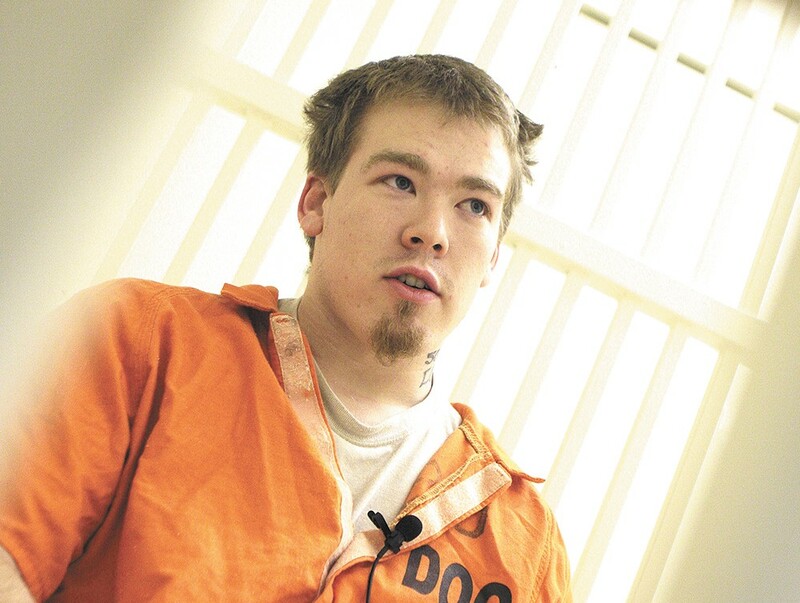 Tyler Gassman speaking from prison in 2010. In trial, attorneys for the state argued that without DNA evidence, Statler, Larson and Gassman could not meet that "extraordinarily high" burden. "This is not the type of case that the Wrongful Conviction Compensation Act was meant to address," Assistant Attorney General Richard Weber told the judge. "Reversal or vacation of the underlying conviction is not sufficient." Last year, the state conceded wrongful conviction claims to three men — Michael Washington in Snohomish County for $11,242; Brandon Olebar in King County for $546,690; and James Anderson in Pierce County, whose final judgment has not yet been entered. A summary judgment also was granted in favor of another plaintiff, Ryan Allen in Thurston County, who was awarded $94,339 from the state. Thirty states, the District of Columbia and the federal government award damages or fixed payments to exonerees. Under Washington's statute, people who were wrongfully convicted can file a claim for compensation against the state in Superior Court. They're eligible for $50,000 for every year they spent incarcerated. The law also provides in-state college tuition waivers for claimants and their children, in addition to reimbursing attorneys' fees and other court-related expenses. For their four-plus years behind bars, Statler, Larson and Gassman are each suing for approximately $225,000. The case, Statler said this week at the downtown office of the Scott Law Group, isn't about the money: "It's about accountability. We just want to move on with our lives." Since his release from prison, Statler, now 28, was diagnosed with post-traumatic disorder. A burly man with a husky voice and a long blond braid running down his back, Statler hopes that if he wins the money, he can seek counseling, go to college to study psychology and focus on his writing career. He's even published a self-help book, The Boss's Philosophy, on exceeding your limits and finding success. Most of all, he wants to support his newborn baby Mathias. "It would be amazing," he says, "if I could more comfortably raise my son." Meanwhile, Paul's father, Duane Statler, is working with Sen. Mike Padden, R-Spokane Valley, and Rep. Marcus Riccelli, D-Spokane, to pass new legislation to force prosecutors to corroborate jailhouse informant testimony in court. Jailhouse informants, or "snitches," are notoriously unreliable, prompting more than a dozen states to enact laws keeping jailhouse testimony out of courtrooms. A 2004 study by Northwestern University found that criminal informants are the leading cause of wrongful convictions in capital cases, accounting for nearly 46 percent of overturned sentences nationwide. Padden and Riccelli's companion bills would force Washington state law to conform with federal standards regarding the use of informant and accomplice testimony in criminal proceedings.